Football Tin Signs There are 9 products. 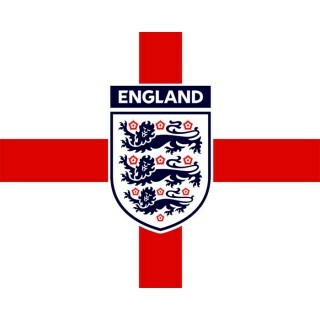 In our Retro Metal Signs Shop we stock collection of Football metal tin signs. Manufactured from top quality aluminum that ensures years-long durability and great look in any place in your home , club , pub or gym . In this section you will find selection of British Football metal tin sign posters . manufactured from top quality aluminum will look grate in any pub , bar , gym or man cave . Grab bargain great opportunity to make fantastic gift or ad this unique fantastic rare metal sign to your collection . 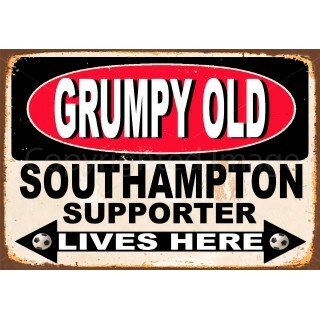 Grumpy Old Southampton Supporter lives here metal sign Grumpy Old Southampton Supporter lives here sign is manufactured from top quality metal which guarantees long time durability and classic look. Manufactured with intentional scratches and having rusted edges this retro football tin sign is an excellent addition to any pub ,bar or man cave . 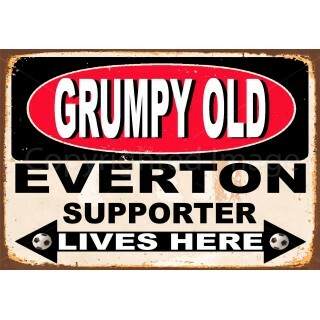 Grumpy Old Everton Supporter lives here metal sign Grumpy Old Everton Supporter lives here sign is manufactured from top quality metal which guarantees long time durability and classic look. Manufactured with intentional scratches and having rusted edges this retro football tin sign is an excellent addition to any pub ,bar or man cave . 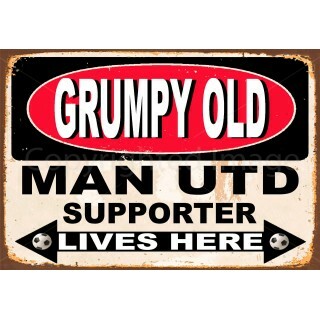 Grumpy Old Man Utd Supporter lives here metal sign Grumpy Old Man Utd Supporter lives here sign is manufactured from top quality metal which guarantees long time durability and classic look. Manufactured with intentional scratches and having rusted edges this retro football tin sign is an excellent addition to any pub ,bar or man cave . 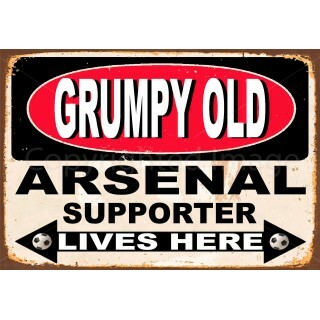 Grumpy Old Arsenal Supporter lives here metal sign Grumpy Old Arsenal Supporter lives here sign is manufactured from top quality metal which guarantees long time durability and classic look. Manufactured with intentional scratches and having rusted edges this retro football tin sign is an excellent addition to any pub ,bar or man cave . 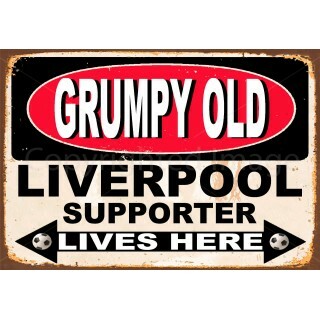 Grumpy Old Liverpool Supporter lives here metal sign Grumpy Old Liverpool Supporter lives here sign is manufactured from top quality metal which guarantees long time durability and classic look. Manufactured with intentional scratches and having rusted edges this retro football tin sign is an excellent addition to any pub ,bar or man cave . 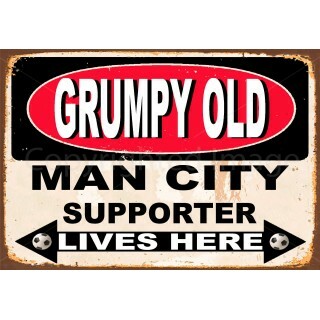 Grumpy Old Man City Supporter lives here metal sign Grumpy Old Man City Supporter lives here sign is manufactured from top quality metal which guarantees long time durability and classic look. Manufactured with intentional scratches and having rusted edges this retro football tin sign is an excellent addition to any pub ,bar or man cave . 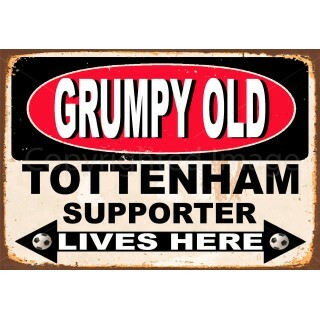 Grumpy Old Tottenham Supporter lives here metal sign Grumpy Old Tottenham Supporter lives here sign is manufactured from top quality metal which guarantees long time durability and classic look. Manufactured with intentional scratches and having rusted edges this retro football tin sign is an excellent addition to any pub ,bar or man cave . 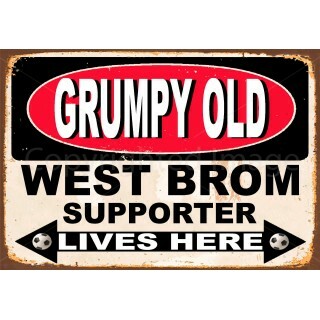 Grumpy Old West Broom Supporter lives here metal sign Grumpy Old West Broom Supporter lives here sign is manufactured from top quality metal which guarantees long time durability and classic look. Manufactured with intentional scratches and having rusted edges this retro football tin sign is an excellent addition to any pub ,bar or man cave . 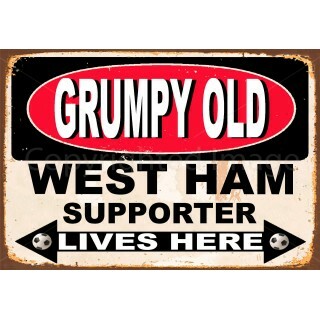 Grumpy Old West Ham Supporter lives here metal sign Grumpy Old West Ham Supporter lives here sign is manufactured from top quality metal which guarantees long time durability and classic look. Manufactured with intentional scratches and having rusted edges this retro football tin sign is an excellent addition to any pub ,bar or man cave . 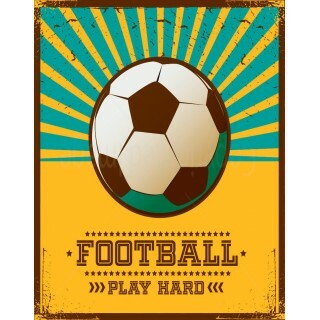 In our Retro Metal Signs Shop we stock collection of Football metal tin signs. Manufactured from top quality aluminum that ensures years-long durability and great look in any place in your home , club , pub or boxing gym .